The speaker is SOLD. A lovely man who lives in the area picked it up this afternoon. I also found documentation of the network crossover replacement, and some other papers - price list, bulletins, 3-channel stereo info. University MID-T - for a 1954 Klipschorn? My grandfather was really into radio; it was his profession. The building is the place he would have had this speaker on display. A couple of decades earlier he probably provided the PA system for the flight of the Flying Keys in Meridian, MS. He is the big man standing behind the car. How interesting, WMcD. Thanks. I tried taking a pic of the two drivers (correct term?) for size comparison. The installed one came out looking larger by comparison, but maybe you'll get the idea. I've also realized that the whole crossover network business was replaced (upgraded?) in 1957. See pix. This doo-dad was kept, I think as a spare part for the 1954 Klipschorn that my grandfather had for sale in his shop. What's it for? (I inherited this and the speaker, but I'm not versed in the technical side.) Would this MID-T be a replacement part for something the speaker already had, or would it have been an upgrade? It's possible that this part came with the speaker and that whatever was shipped by University Loudspeakers was the upgrade and got installed in 1956. In other words, does the sales slip for a model MIT-60 match the object pictured? Thanks! Thanks analogman and dwilawyer for sharing your insight. I'm still torn about parting with this speaker, but if the right buyer comes along... Travis/dwilawyer, thanks for the heads up about the Klipsch museum. The videos had enticing tidbits about early speakers. If they really wanted mine, I would consider it, but I don't know where they would find room to put it! I'll keep watching for replies and messages here for a bit. Y'all let me know if you would like to see more photos. 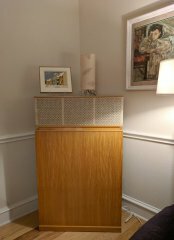 We're downsizing and could be persuaded to part with the lovely Klipschorn mono speaker. This forum was very helpful in 2011 when I last considered parting with it, and I wanted to start here to see if anyone would be interested now. It sounds fabulous, even mono. It's in great condition, some crazing in the finish, original grill cloth. (Y'all got excited about that last time, hee hee.) Measurements: 31"W x 28"D x 51"H. All original, primavera finish. My grandfather Hagemeyer sold radio equipment in Mississippi, bought this for his shop in the 1950s, and couldn't sell it. My dad took it off his hands in '58 or '59. Local pick up in Plano, Texas would be ideal. If you can arrange packing and pickup from my home, that works too. Asking $1500. We are downsizing and thinking it may be time to part with the lovely Klipschorn. It still sounds amazing.